Salter Brecknell’s C3255-60 is a fully functional checkweighing scale built with a stainless steel construction that is wipe-down environment friendly and legal for trade. In addition to basic weighing, Salter Brecknell C3255 bench scales include a checkweighing bar graph, push button target setting, simple weight display, over/under/accept indicators, and audible alarm for target. 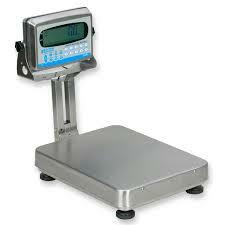 Salter Brecknell C3255-60 bench checkweighers run on batteries or an AC adapter for maximum versatility. The display column folds down for easy storage and shipping. Salter C3255-60 bench scales weigh up to 60 pounds in 0.02 pound graduations.